There is widespread popular support for using renewable energy, particularly solar and electric vehicles. Technology to utilize the forces of nature for doing work to supply human needs is as old as the first sailing ship. But attention swung away from renewable sources as the industrial revolution progressed on the basis of the concentrated energy locked up in fossil fuels. This was compounded by the increasing use of reticulated electricity based on fossil fuels and the importance of portable high-density energy sources for transport – the era of oil. As electricity demand escalated, with supply depending largely on fossil fuels plus some hydro power and then nuclear energy, concerns arose about carbon dioxide emissions contributing to possible global warming. Attention again turned to the huge sources of energy surging around us in nature – sun, wind, and seas in particular. There was never any doubt about the magnitude of these, the challenge was always in harnessing them. Today we are well advanced in meeting that challenge. Wind turbines have developed greatly in recent decades, solar photovoltaic technology is much more efficient, and there are improved prospects of harnessing tides and waves. Solar thermal technologies in particular (with some heat storage) have great potential in sunny climates. There is a fundamental attractiveness about harnessing such forces in an age which is very conscious of the environmental effects of burning fossil fuels and sustainability is an ethical norm. So today the focus is on both adequacy of energy supply long-term and also the environmental implications of particular sources. In that regard the near certainty of costs being imposed on carbon dioxide emissions in developed countries at least has profoundly changed the economic outlook of clean energy sources. A market-determined carbon price will create incentives for energy sources that are cleaner than current fossil fuel sources without distinguishing among different technologies. This puts the onus on the generating utility to employ technologies which efficiently supply power to the consumer at a competitive price. Sun, wind, waves, rivers, tides and the heat from radioactive decay in the earth’s mantle as well as biomass are all abundant and ongoing, hence the term “renewables”. Only one, the power of falling water in rivers, has been significantly tapped for electricity for many years, though utilization of wind is increasing rapidly and it is now acknowledged as a mainstream energy source. Turning to the use of abundant renewable energy sources other than large-scale hydro for electricity, there are challenges in actually harnessing them. Apart from solar photovoltaic (PV) systems which produce electricity directly, the question is how to make them turn dynamos to generate the electricity. If it is heat which is harnessed, this is via a steam generating system. 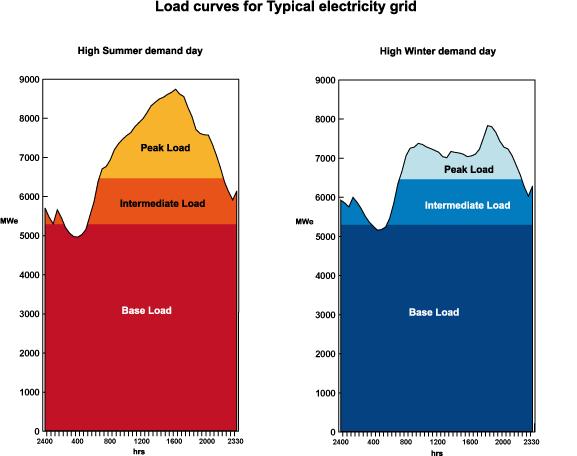 Most electricity demand is for continuous, reliable supply that has traditionally been provided by base-load electricity generation. Some is for shorter-term (eg peak-load) requirements on a broadly predictable basis. Hence if renewable sources are linked to a grid, the question of back-up capacity arises, for a stand-alone system energy storage is the main issue. Apart from pumped-storage hydro systems (see later section), no such means exist at present on any large scale. However, a distinct advantage of solar and to some extent other renewable systems is that they are distributed and may be near the points of demand, thereby reducing power transmission losses if traditional generating plants are distant. Of course, this same feature sometimes counts against wind in that the best sites for harnessing it are sometimes remote from population, and the main back-up for lack of wind in one place is wind blowing hard in another, hence requiring a wide network with flexible operation.